A third supermarket chain has committed to stop selling sharks fin at its outlets in Singapore, a Straits Times (ST) report said. This comes just after NTUC FairPrice announced its intention to cease all shark's fin sales before April this year. Carrefour, Singapore's first hypermarket chain, told ST on Friday that they will stop selling shark's fin after its current stock is cleared. The report added that it is making this decision for no reason other than being socially responsible. The French supermarket chain, which has outlets in Plaza Singapura and Suntec City, could not be contacted for comment on the matter. This announcement comes after Singapore's largest supermarket chain, Fairprice, announced that it will withdraw all sales of shark's fin products before April this year -- but after Chinese New Year -- due to a public uproar after an insensitive message was posted by one of NTUC Fairprice's seafood supplier Thern Da Seafood. The supplier had posted on Facebook on 17 Nov 2011 at 12.14am, "Screw the divers! Shark's fin and Mola Mola will also be launched at all NTUC Fairprice outlets during CNY 2012! Exact date for launching will be out soon!" NTUC Fairprice told Yahoo! Singapore that they were alerted to the post on Wednesday and immediately investigated the matter. On Thursday, the supermarket chain provided an update on its Facebook page and said they it will be withdrawing all products from Thern Da Seafood from its network of more than 230 outlets. Fairprice wrote on its Facebook page, "As a standing instruction, all our suppliers are required to clear their joint promotional materials and messages with us before implementation. In this incident, the supplier had not complied with our standing instruction." The supermarket chain also added that Fairprice values sustainability and that it has been looking into the sale of shark's fin in the past few months. Many have applauded the move by Fairprice but some are asking the supermarket chain to stop sales immediately. Facebook user Jason Baran said, "If you have any ethics, you will withdraw all such products from your shelves immediately. How about I have me and my friends not shop at any of your stores until after first quarter also? Others defended Fairprice's move to delay the withdrawal until the end of March by saying that Fairprice is being responsible by allowing lead time for its suppliers to react. "It's a case of being a responsible trade partner as well. As long as FairPrice is committed in the goal of eventually phasing out the sale of such products (and has given themselves a fixed time frame), it's something we can, as consumers, look forward to," said Julius Sim. Animal rights activists praised the move. “They have shown that they truly embrace corporate social responsibility and that they do listen and respond positively to public feedback. ACRES hopes that other companies will follow the example set by NTUC and also stop selling shark’s fin,” said Louis Ng, executive director of Animal Concerns Research and Education Society (ACRES). 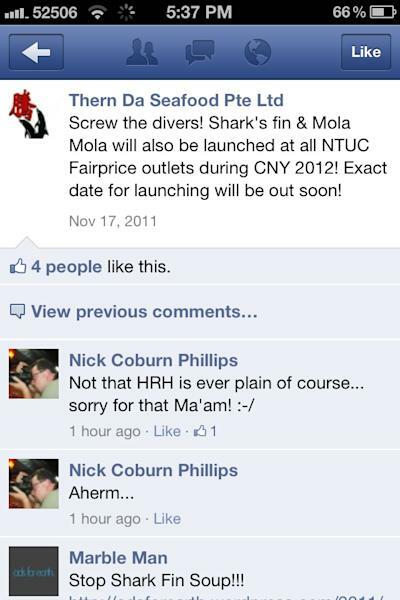 the sales manager of Thern Da Seafood, could have been a response to a group of local divers who had last year criticised the company online for bringing in Mola Mola, a seafood considered to be a delicacy in Asia. Budin Aris, the founder of online community ScubaSG told Yahoo! 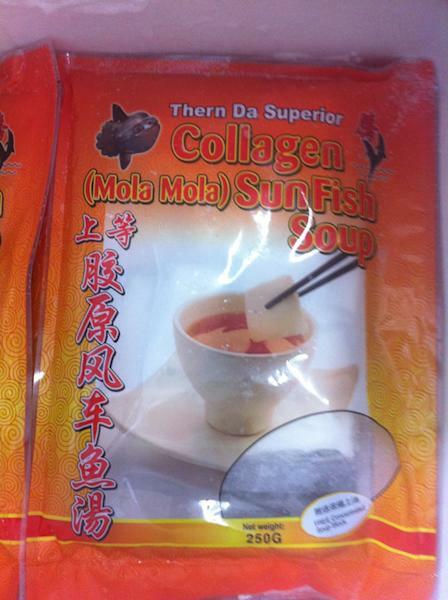 Singapore that a fellow diver spotted the sale of Mola Mola at local supermarkets and went online to criticise Thern Da Seafood. However, he is unsure if the message was directed at divers generally or ScubaSG members. According to blogger Angela, the seafood supplier had taken down its Facebook page at 6.40pm after it generated about 200 shares and 150 negative comments on Wednesday. attempts to contact the seafood supplier had been unsuccessful. NTUC Fairprice is the second supermarket to initiate a "no shark's fin" policy after Cold Storage announced the policy in October last year. Cold Storage joined the World Wildlife Fund (WWF) Singapore Sustainable Seafood Group and is the first retail food chain to source and offer sustainable seafood recommended by WWF.